What’s wrong with this zucchini? What’s wrong with this zucchini? The one on the left is yellowing and shriveling up. It wasn’t either fully pollinated (some bee didn’t do her job) OR once again it was too hot when pollination happened and it didn’t take hence it is self aborting. 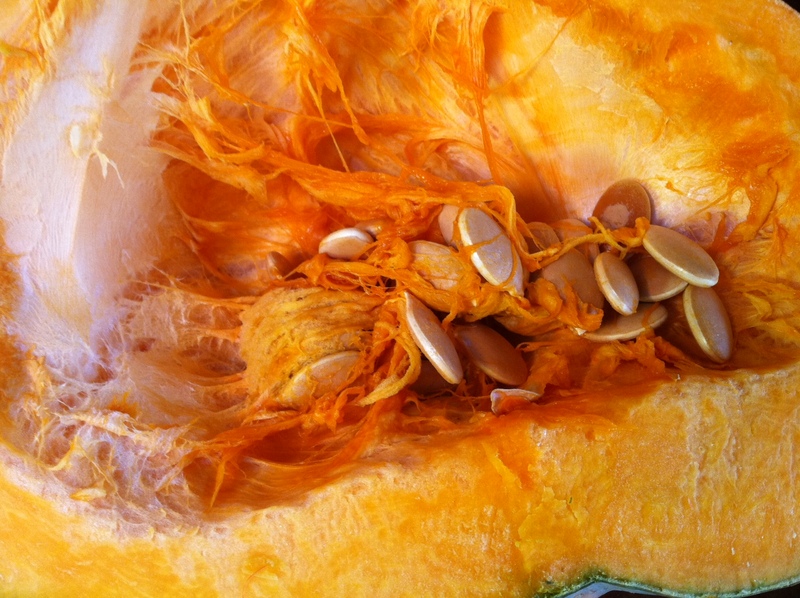 Just like tomatoes, all squash likes the heat but not when it is trying to pollinate. The zucchini on the right side of the photo is fine. 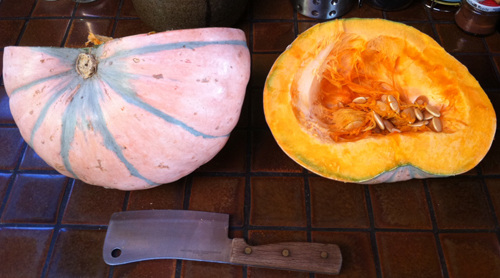 Article first published as The Mystery of the Calabacita Squash on Blogcritics. 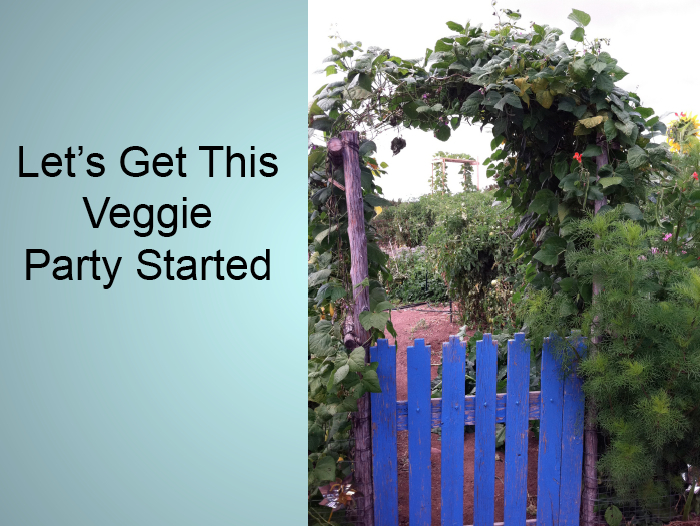 Story by giantveggiegardener. As a gardener and a cook, I’ve been searching for a particular squash seed-the Mexican Calabacita. It was the original squash used to make the famous ‘Calabacitas’ dish of squash, corn, onions and green chili here in New Mexico. Most of us now use zucchini to make this savory dish because of it’s availability, but here at the Santa Fe Farmers Market, you can buy the Calabacita squashes in early summer and then by mid summer, they are gone. They are little green squashes with soft skin and teeny weenie seeds-too small to harvest. I researched it and found that the squash originally came from Mexico but not a lot of information is out there on it. No seed catalogs have it. None of my gardening friends have any seeds. I couldn’t find it anywhere. Then two years ago while on vegetable gardening forum here in Santa Fe, I met another gardener and during the course of our conversation after the forum, the mysterious Calabacitas squash came up. I told her of my difficulty finding the seeds. She told me she had gotten some Calabacita seeds from another farmer whose family had been here for generations. She offered me a few of the seeds. Finally I would get some seeds! So we emailed each other and I sent her an envelope to send me some but they never came. I went by the Farmers Market where she sells produce but we kept missing each other. Another season passed and still no seeds. This year, on the last day of my season as ‘The Tomato Lady’ at the Farmers Market where I sell heirloom tomatoes, I went by her booth and mentioned maybe I could get some of those seeds for this upcoming season. She said,” Why not buy one of the squashes now?” When she pointed them out, I said, “That’s one of them? It doesn’t look anything like the ones earlier in the season” and she remarked, “Yes that’s one of them. They are actually a type of WINTER SQUASH. We just pick them when they are really young and immature and have no seeds”. That explains it! Why I could never get any seeds from them. That is why we don’t see them later on in summer-if you let it keep growing; it will become a mature winter squash. There were several there at her booth with different colors. Some were green with orange stripes and some were salmon color with green-grey stripes. She said there really wasn’t any difference in the taste. I ended up with the salmon-green striped one. It weighed about 15 lbs and has a squat oval shape outside and lovely orange color inside. It smelled like a cross between a cucumber and a melon. I got the seeds and roasted the squash. To roast it, I quartered it and rubbed some oil on it and put it on a cookie sheet. Then I added a little water in the bottom of the pan so it wouldn’t dry out. I put it in the oven at 350° and placed some aluminum foil loosely over it so it would not burn. It took about an hour to cook. Afterwards, I put the flesh in a freezer Ziploc and will later cook squash lasagna with béchamel sauce. 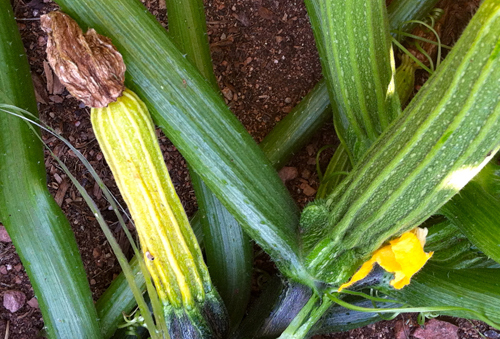 So Calabacita squash can be used to make Calabacitas in early summer or later in the fall used in winter squash dishes. Sauté the onion, add the squash and corn and sauté till tender. Add cumin to taste. Add New Mexico green chili to taste. Squash bugs are around my squash and pumpkins right now. I go out AT LEAST ONE TIME A WEEK and go hunting for adults, nymphs and eggs. 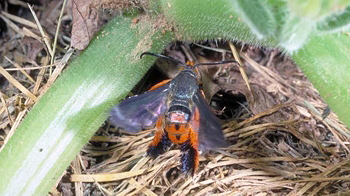 I know the ADULTS LIKE TO HIDE DOWN AT THE BASE OF THE PLANT or underneath the leaves. I take the hose and spray the whole plant and at particularly at the base which is covered in straw. The adults come running up the stems of the leaves to escape the water. Then I pick them off with my hand. I hate handling bugs barehanded so I use gardening gloves. I either squish them on the ground or put them in a bucket of soapy water where the adults drown. No mercy. I then look at EACH LEAF of the plant to see if there are any EGGS ON THE UNDERNEATH SIDE OF THE LEAVES, usually in the “v” where the veins form. If I find them, I either tear off the whole leaf (if I have a lot of leaves) or I tear out just the section that has the eggs and put them is a bucket of soapy water where they will smother. THE EGGS WILL BE DARK LIKE ROOTBEER WHEN THEY ARE READY TO HATCH, so get them EARLY. I also look for the GRAY NYMPHS WHICH ARE USUALLY UNDERNEATH THE LEAVES OR ON THE STEMS. If I find a few I squish them. If I find a lot, I take the whole leaf off because they are fast and I can get them all. Then I put them in the soapy water. Squash bugs go from EGGS TO NYMPHS IN 7-10 DAYS, so we should look for eggs about every 7 days to catch them from turning into nymphs. I do this on the weekend when I have more time. The squash bug PRODUCES ONE NEW GENERATION EACH YEAR but of course if each squash bug lays 15 eggs on each leaf they chose to deposit their eggs on, then all those newly hatched nymphs will lay more-but not this year. The nymphs will grow into adults this year but will not lay eggs. They will overwinter and lay their eggs next year. So my thinking is if you get the adults now and the eggs now, then next year you should have way less squash bugs (I’m assuming we might miss a few) and of course if we get them all, in theory we should have none next year. I keep my plants covered early in the season with row cover until they flower but now that they are flowering, I must uncover them so the bees can pollinate them. The key is to be REALLY DILIGENT ABOUT FINDING THEM BEFORE THE EGGS HATCH. After they hatch you can easily be overcome by the nymphs. Most people don’t keep up on the inspections and then the problem magnifies tenfold-so keep up on them. The hunt is on! Some people spray Sevin on the plants. I prefer to go organically, so if I get a major problem, I would use Neem which is somewhat helpful but picking them off is the best way to control them.